Tiger to put Last Born in his place! 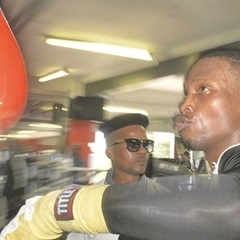 Johannesburg - Zolani “Last Born” Tete has vowed to not allow the misfortune of being a victim of housebreaking cloud his mind ahead of his crucial world title defence. Tete will voluntarily put his World Boxing Organisation (WBO) bantamweight crown on the line against fellow South African Siboniso Gonya at the SSE Arena in Belfast, Northern Ireland, on Saturday. The kingpin from the Eastern Cape, who three weeks ago set up a training camp at Urban Boxing Gym in Sandton, Johannesburg, was dealt a blow after his home in Mdantsane, East London, was broken into last weekend. Tete said thieves burgled it while he was in Gauteng preparing for the big showdown. They stole a plasma TV worth R20 000, a decoder, a pair of training shoes and other household goods. “Those thugs obviously capitalised on my absence from home,” said Tete. “This is a difficult situation, but I won’t allow it to dampen my spirits. My focus right now is on winning the fight". Last Born is taking his upcoming bout seriously and demonstrated his skills to the media ahead of his departure for the UK. Tete was previously supposed to have put his title on the line against KwaZulu-Natal-born Gonya at the Sisa ­Dukashe Stadium in Mdantsane. However, it could not take place in Tete’s backyard after the Eastern Cape sport department failed to secure funds to stage the fight, despite having promised to do so. Tete’s British promoter Frank Warren of Queensberry Promotions stepped in to stage the bout in the UK. Watching him during a gruelling workout at a media open day, it was evident that Tete is in the best shape of his career. Trainers Mhikiza Myekeni and Phumzile Matyila put him through his paces, and both will man his corner during the bout. The duo will replace head mentor Loyiso Mtya, who has parted ways with the pugilist. Myekeni was in Last Born’s corner when he won the International Boxing Federation super flyweight crown after beating Japanese Teiru Kinoshita by a unanimous points decision in Kobe, Japan, in 2014. Tete is so confident of winning that he says he is dedicating his victory to his ailing mother, Nomonde. “She is very much supportive of my boxing career. I wish she could have accompanied me abroad for this particular fight. But she is very sick at the moment and being cared for at home by my dad". Tete has been nominated for a sport star of the year award at the SA Sports Awards, which will take place at Emperors Palace on Sunday evening. Other nominees are athletics superstars Caster Semenya, Wayde van Niekerk and Luvo Manyonga, as well as Bafana Bafana and Mamelodi Sundowns forward Percy Tau. Tete (29) is the first boxer to be nominated for the award. “It has always been a dream to have my name mentioned alongside top athletes in the country. It’s a big thing to have a boxer nominated in the sports awards,” Tete said. He is an experienced campaigner with 28 fights (25 wins and three defeats), while Gonya has 11 victories and one loss from 12 professional starts. “I’m looking forward to retaining my title and proving that I’m the country’s best boxer,” Tete said. Gonya, the current WBO intercontinental champion, is confident that a new WBO champion will be crowned. “I have trained very hard for this fight and am determined to cause an upset. Winning in front of UK fans is what I want to achieve".